FireFly is a brand new Bus Compressor brought to you by SoundSpot, with a diverse range of options to optimise both transients and stereo image, this outstanding compressor also features a sidechain filter for compressing loud kicks and heavy bass parts, however, that isn’t the stand out feature. FireFly also features an analogue mode which in my opinion is the perfect tool for adding non-linear colouration to your mixes, alongside this it also has an adaptive noise generation tool for creating perceived loudness and adding an additional layer of character. its also separates both left and right and gives you a very appealing visual reduction graph, It’s also extremely light on your CPU so it won’t max out all of your computers power. But what really makes this plugin different is the analog option, which when enabled adds low-level ambient noise to your signal which follows the volume curve of the incoming audio signal which then makes the signal sound as if it is being processed through a real analog compressor instead of a digital one. Just under the analogue option FireFly features a pre-compressor transient booster called a Punch effect with 2 options of lightly aggressive and very aggressive, overall the analog and punch features add a layer of static under the signal which use RMS compression to roll the effects off nice and smoothly, adding a touch of old-school character and takes away some digital crisp. 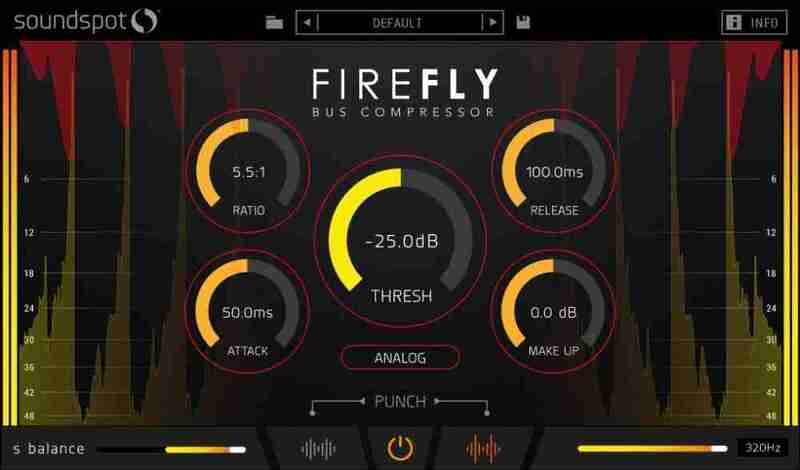 FireFly is a modern-style bus compressor with flexible options to optimize your track's transients and stereo image. Next to the very aggressive option, you’ll see a slider with the initials SC, this is the side chain bypass feature designed to be used on the lower frequencies of your track which can go all the way up to an impressive 320Hz, say if for instance you have a deep kick and don’t want it to trigger the compressor pull the slider up to around 100Hz where the kick ‘should’ live you can see only a minute amount of gain reduction happening. On the opposite side of the plugin, you’ll notice another slider, this is an extremely handy feature called the stereo balancer which works in exactly the same way as a low cut filter, place the slider in the centre and it will adjust the audio in the middle of the mix, place it on the left or right to get the same desired effect for this area the mix. And the best part is, The FireFly Bus Compressor is currently only $7.89!